Missile, Air-to-Air, Atoll; also Designated K-13 (AA-2):, originally uploaded by cliff1066. 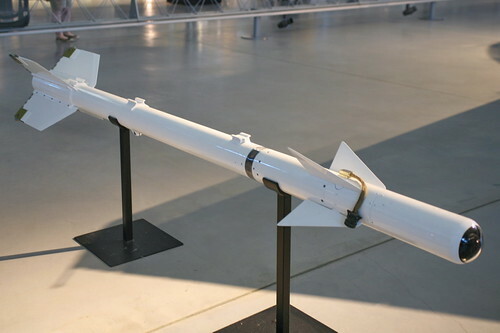 This is the Atoll, an air-to-air missile of the former Soviet Union. Atoll is the NATO code name for the Soviet K-13, a copy of the U.S. Sidewinder air-to-air, heat-seeking missile. Atoll originated in 1958, when a Sidewinder fired from a Taiwanese F-86 fighter in the Taiwan Strait lodged in an aircraft of the People's Republic of China but did not detonate. China recovered the missile intact and turned it over to the Soviet Union who copied the design, mass-produced the missile, and exported Atolls to its client states. The Atoll has the same basic dimensions as the Sidewinder but has been modified over the years and is still in use.